The film, which is loosely based on a true story, depicts the story of Joy Mangano, an American woman that rises above all personal and financial adversities to become a phenomenal businesswoman and entrepreneur. 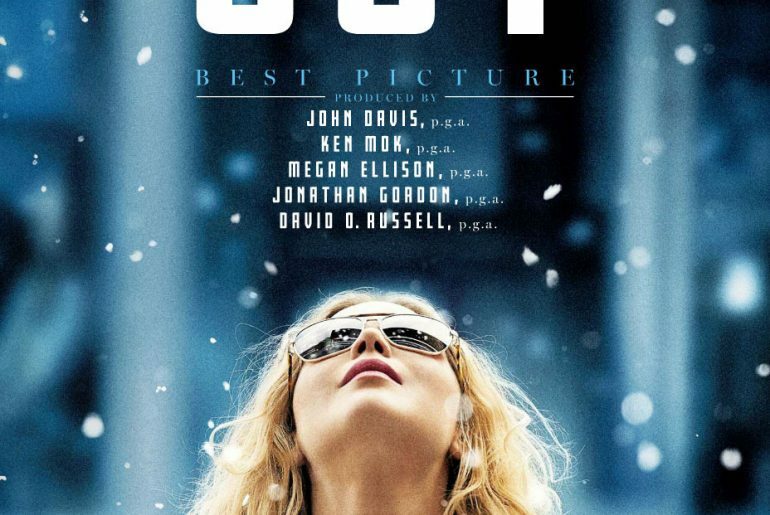 The plot is told from the perspective of Joy’s grandmother, Mimi, the only person in the four-generation family that firmly believes in Joy’s innate and childhood desires to become an inventor.The dependence on the family on Joy prevents her from doing anything she wishes she could do, until she realizes that she has to do something if she wants to change her current situation, with her dysfunctional family dragging behind. Thus, she invents the Miracle Mop, which becomes a huge success after she is able to feature it on TV for QVC, a successful business corporation. Joy Mangano (J-Law): divorced mother of two, she worked as a booking clerk before she came up with the Miracle Mop. As a child, Joy loved creating and making things, hoping that one day those dreams would materialize. Though Mimi does not input much into the story, her consistent belief and loyalty on her granddaughter has lasting effects on Joy, as she eventually succeeds. However, once Joy’s Mop is a hit, she meets with even more adversaries in the business world. Her manufacturing company illegally attempts to patent the Mop, until Joy discovers the fraud in their insidious plot and wins her product back. Neil Walker (Bradley Cooper): executive of QVC, he is the one that sees something in Joy when she presents herself at his office and convinces Neil that the Mop can be a hit. Again, the belief that Neil has on Joy enables her to become even more confident about her product, and is thus able to succeed. Rudy Mangano (Robert De Niro): Joy’s father, he moves back to Joy’s home at the beginning of the film after his other wife dumped him. Pretty much a womanizer, it isn’t long before he ‘falls in love’ with another woman. Though he shows his fatherly love for Joy, he doesn’t act the part. All he does as soon as he’s back home is pick up fights with the other people residing in the house. Trudy (Isabella Rossellini): Rudy’s new wealthy girlfriend, she reluctantly agrees to invest in Joy’s product. However, Trudy and Rudy are anything but cooperative or supportive throughout the film. It’s all about how much money can be made, how much money you owe her, etc. Terri Mangano (Virginia Madsen): Joy’s mother, she’s anything but productive. She has no idea what goes on around Joy’s life unless it can be featured on the TV. Still, Joy takes care of her all the way throughout. Tony Miranne (Édgar Ramírez): Joy’s ex-husband. Although their marriage didn’t work out, they maintain a very amicable friendship with each other. Additionally, through Tony’s connections, Joy is able to get the opportunity to publicize her product at QVC. Jackie (Dascha Polanco): Joy’s best friend, she is Joy’s backbone. Jackie encourages Joy’s every decision, helps her try to market the Mop, works alongside Joy to manufacture the product, etc. Peggy (Elisabeth Röhm): Joy’s half-sister, she is the Drizella/Anastasia of the story. Jealous, she attempts to sabotage and interfere with Joy’s business. Her closeness to ‘daddy’ (Rudy) makes her attempt to try to bring out the product she and Rudy created (though it never happens). As the film is set in the 1990’s, the scenery is pretty much all you can find back in that time. However, the filming techniques were not very… distinguished. There are several scenes in which the camera casts the characters while they stand in the shadow, switching the perspective of the audience. The camera itself jumps from third-person to first-person perspective all around, which gives both an objective and deep insight into the occurrences of the film. However, because the story is told from Mimi’s perspective, there are flashbacks into Joy’s past life. That filled in most of the gaps of the present situation, but when it came to portraying Joy’s recent past, I feel that a better job could have been done to differentiate the present from the past. I gave this film 4 stars mainly because of the overall feeling that I got after watching the film. You could say that I rated it based on the credibility and content of the film. As someone who knows little about the actual business world, I feel that I came out of this film with a newer outlook on business. I love the image that Joy portraits. She starts off her Miracle Mop knowing nothing about business, but her experience enables her to learn quickly about the reality of the world that surrounds her. Despite Joy’s flawed family and the fact that every ‘stable’ thing in her life does not seemingly contribute much to her success, they actually do. As a woman who was restrained her emotional and personal wishes for the sake of her family, her situation made her even more determined to succeed. Because most people around her believed she couldn’t, while she deep inside knew that she could. Her perseverance and stubbornness to give up clearly paid off. Rudy, despite being a mediocre father, brought someone into his life that set the start to Joy’s business. Despite their unwillingness to give her the moral support that she needed, without Rudy and Trudy Joy would have had to find another (possibly harder) way to produce the Mops. Finally, though I found Tony a bit helpless at the beginning, he becomes that caring father and the supportive friend that Joy needs. He is the one that connects Joy to QVC. Joy’s dysfunctional family was not that dysfunctional after all. I guess there is a silver lining in all things, after all. The film was an unexpectedly joyful, and I would recommend it to anyone who enjoys learning from first-hand experiences of other people (I know this film is partly fictional, but it is also based on a true story). The cynicism and cruelty that the film apparently portraits proved to be an absorbing drama film for me, and I’m sure that most people would enjoy it too. On the other hand, I know almost nothing about what I just talked about, and you could have read all of what I just wrote and thought that this is a crappy film. In that case then, don’t watch it. Good review- I enjoyed the film- but found the characters frustrating and I felt the movie was a bit too Long…. Most characters were soo annoying/frustrating/helpless – true, and that’s why the film is so effective.